That was an exciting one, wasn't it? Cars flying off the road, also-rans appearing in points-winning places, and a position swap at the front in the dying laps. Rain (or in this case a deluge) did its usual job of shuffling the order and preventing a procession. In my view it was not a great race, however. Generally, I like wet races because they give the drivers in lesser cars a chance to shine. But, when many of the drivers are eliminated by a lake at one corner, much of the interest disappears. Consider how those who support Rosberg, Button, Sutil and the Toro Rosso team must have felt at the sudden exit of their heroes. And the fact that Hamilton, another who slid off at that corner, was helped back on to the track must have rubbed salt into the wound. To digress briefly, I think it was legal that Hamilton should receive assistance in that way, although the rules do not mention the role of cranes in such circumstances. Lewis had kept his engine going and remained in the car while others had already climbed out of their beached machines. It seems only fair that he should benefit from his greater foresight. What that first corner incident did demonstrate was the inconsistency of rule application by the stewards, however. I have seen races stopped immediately for much less than the multiple car park created at turn one; in my view, the red flag came out far too late, the dangerous situation at that corner being shown in such incidents as the pace car having to avoid an accident with an out of control STR and Scott Speed nearly colliding with a crane that was trying to sort out the mess. It was only fortune that dictated that each car came to rest in a different spot from the others. 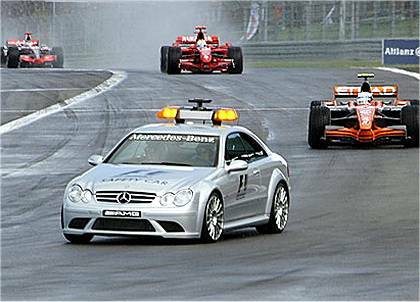 Had the red flag been shown at the time and instead of deployment of the safety car, we could also have re-entered the old argument about whether drivers should be allowed to take the re-start in their spare cars. Obviously, my opinion is that they should because the field is not depleted as a result. Admittedly, the race delivered plenty of other talking points. The timing of blue flag waving inevitably comes under scrutiny after Hamilton was shown the flag while Massa was still far behind him, the matter of just how much a driver can do in defence of his position arose as Alonso tried to get by Massa, and there was talk of penalties after Alonso's near collision with Fisichella in the pit lane. Fortunately for F1 (which hardly needs an amended result to a race while present political battles continue), the stewards decided that none of these required their interference. But note that these are all matters that require interpretation of the rules. It may be that the rules have become so complex that pure racing has to take a back seat while officials debate the meaning of obscure details in some much-amended regulation. Some things just have to be left to common sense. As regards the actual racing, I thought that Alonso drove an immaculate race, surviving the chaos of the opening laps, staying in contention when the Ferraris were clearly quicker than his McLaren, and then taking advantage when the weather conditions gave him a car that could win. Jean Todt's dissatisfaction with the result is understandable but mean-spirited; he has taken his share of weather-influenced wins without complaint in the past. It was good to see Webber coming through to third place as well; he has had awful luck and reliability this season and it was about time his speed and determination were rewarded. Much the same goes for David Coulthard and his fifth spot. But it was Alex Wurz who demonstrated the greatest and most generous spirit of the afternoon. Have a look at this revealing photograph from Pitpass - it shows Alex congratulating the man who beat him to the podium, Mark Webber, after a stirring battle in the last few laps. Racing does not have to be about inflated egos and excuses for losing. For me, that comes very close to dislodging Alonso from his position as driver of the day. Good on yer, Alex. Watching this race there was one huge factor that annoyed me. Again Kimi's luck deserted him twice when he needed it the most, of course there was a performance from him to get back into contention but yeah again his luck wouldn't have it. Looking at the start of the race, he got ahead cleanly and with more fuel in the car and qualifying on pole it was his race to lose really and I was confident he could get it back. Lady luck though would not have this, throwing huge rain showers and somehow making Kimi's car slide unbelievably out of the pit lane. After the rain had stopped, he strived to get himself back into contention and he did, coming right up behind Alonso and possibly able to get him in the pits. Unbelievably a mechnical problem again destroyed his hopes and ruined my race a bit. I have to say I am really a Kimi fan, I've always felt he's been incredibly fast and his luck destroying his hopes really ruined it for me. Alonso, led a great race not once putting a foot wrong and his move on Massa was legit for me, it was Massa's ridicolous defensive driving that meant they touch wheels. Wurz as you say did a fantastic job in the Williams and that picture is great to see, credit to him. I'm thankful that Webber got that podium, he's deserved a good result like this all season but again his luck has plagued him, I've always considered him a great driver. As for Hamilton, I felt the decision to put him on dry tyres was crazy and lost his advantadge of un-lapping himself under the safety car. Again staying out on drys caused him to lose a point at least as it was considered not possible for him to get a point, when looking at the fact that even with that he was right behind Kovaleinan. Massa I wasn't impressed with at all really but then again I haven't been much lately. The real disappointment was seeing the championship fight slip away from Kimi due to no fault of his own as per usual. You are so right, Pootle - Kimi's bad luck is a major factor in his not being a world champion as yet. He is resilient, however, and can still make a fight for it this year. The dry weather tyres on Hamilton's car was a calculated gamble similar to the one Renault tried with Kovalainen later in the race. If the second rain shower had come earlier, Heikki would have looked very good and, if the track had dried a little quicker, Hamilton would have had a much better chance of getting into the points. Kudos to Wurz for congratulating Webber on his podium. Those two really did have a good fight, as did Coulthard just behind them. Yes, it was very close in the closing laps, Alianora, and Wurz nearly managed to get past in the last corner. I noticed in the TV broadcast how he went straight from his car to congratulate Mark, so I was really pleased to find the photo on Pitpass.